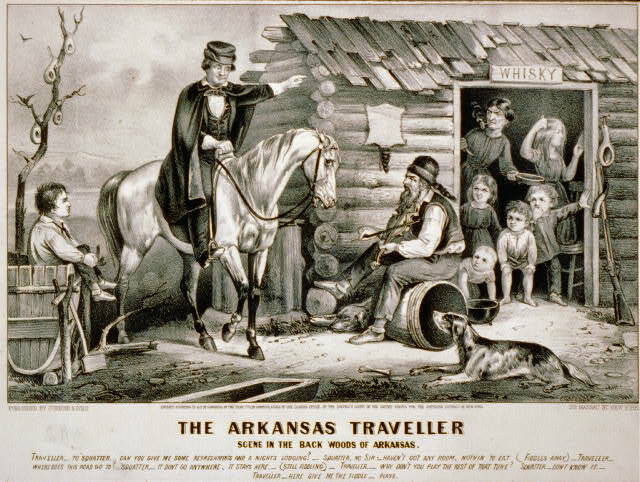 This 1870 Currier and Ives lithograph was inspired by The Arkansas Traveller, a melody with a story that appeared around 1850 when the tune came into vogue among fiddlers. Arkansas artist Edward Payson Washbourne painted this famous scene in 1856. The image depicts a wise-cracking, fiddle-playing squatter's encounter with a sophisticated city-slicker or traveler. The dialogue and tune, performed and recorded by Steve Porter and Ernest Hare in 1922, are part of the American Variety Stage collection at The Library of Congress. Between 1901and1919, Len Spencer recorded the song for a variety of record companies such as Edison and Columbia. In 1925, The Blue Ridge Duo recorded a square dance version for the Edison Record Company. Image Caption Text: Traveller, - To Squatter, - Can you give me some refreshments and a night's lodging? - Squatter, No sir - Haven't got any room, nothin to eat (fiddles away) - Traveller - Where does this road go to? - Squatter, - It don't go anywhere, it stays here, - (Still fiddling) - Traveller, - Why don't you play the rest of the tune? Squatter - Don't know it, - Traveller - Here give me the fiddle - plays. 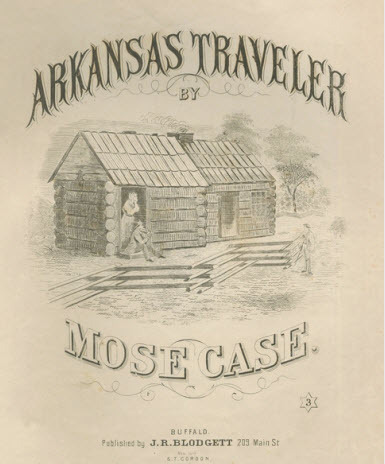 A brief historical timeline of The Arkansas Traveller is presented below. Fuld, James J. The Book of World-Famous Music. New York: Dover Publications, Inc., 1996. pp. 107-108. Mercer, Henry Chapman. On the Track of the Arkansas Traveler. The Century illustrated monthly magazine. 1896.